In the wake of Andres Manuel Lopez Obrador’s historic victory, the markets are focused on Mexico’s economic prospects, keenly sniffing for any whiff of either pragmatic promise or populist calamity. Yet while a financial crisis is possible, Central American migration may prove the new administration’s biggest first challenge. Since 2014, hundreds of thousands of Central American men, women, and children, mostly from Guatemala, Honduras, and El Salvador, have fled their homes. Driven by violence, extortion, poverty, and a drought that has decimated subsistence farming, and pulled by family connections and the hope of safe haven, they mostly head north. This desperate exodus brought some 280,000 migrants to the southern U.S. border in 2014, driving a media storm and political reckoning. Images of young children spurred churches into action, political demonstrations across the country, and even conservative talk show host Glenn Beck to drive to the border with a truckload of teddy bears and soccer balls. Congress doled out extra money to care for more than 50,000 Central American “unaccompanied alien children,” or UACs in the Department of Homeland Security’s parlance; the Obama administration worked with the presidents of El Salvador, Guatemala, and Honduras to launch the Alliance for Prosperity, a two-year $1.4 billion dollar plan to spur better governance and economic development. In 2015 the massive migrant wave to the U.S. border diminished, and the cameras largely turned away. Yet the precipitous decline wasn’t because Central Americans stopped leaving their homes. It was because Mexico stopped letting them through. Backed by more than $150 million in U.S. funding, Mexico tightened its southern border, expanding checkpoints, boosting manpower, and using fingerprinting and facial-scanning to identify and detain crossers. The government even cracked down on the infamous La Bestia (“the beast”) freight trains that carried thousands from the southern border city of Tapachula north. That year, Mexico apprehended and deported more Central Americans than its northern neighbor. This status quo of Mexico stopping tens of thousands of families each year may soon end. On the campaign trail, Lopez Obrador promised to loosen Peña Nieto’s southern border defense, refusing to “continue the dirty work” of the United States by detaining Central American migrants who are fleeing violence. As Mexico looks to ease up on its southern border, the U.S. is strengthening enforcement. President Trump’s pullback from separating young children from their parents at the border — spurred by negative media coverage — is just a brief hiatus from an ever-hardening position toward Central American migrants and asylum seekers. The Department of Justice has rewritten the asylum guidelines, raising the credible fear bar asylum seekers must reach, and all but disqualifying those fleeing criminal and domestic violence, thereby denying most Central American claims. The administration has slashed refugee spots by more than half, and tinkered with rules to deny many their day in court. 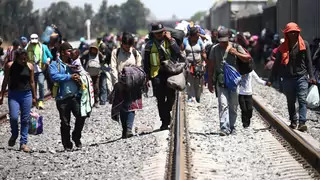 And the U.S. is threatening to impose its own version of the European Union’s Dublin Regulation, under which those seeking asylum must generally do so in their first country of arrival, thereby rendering moot the asylum claims of Central Americans crossing through Mexico. The net result: Tens, if not hundreds, of thousands of Central Americans will likely get stuck in Mexico. There, these migrants will have expansive protections — at least on paper. A 2011 legislative reform guarantees asylum seekers quick and comprehensive consideration, legal representation, and an appeal. While in Mexico they have the right to apply for access to medical care and education. In reality, these rights are at best uneven. Amnesty International found that three out of every four migrants weren’t informed of their right to seek asylum, as the law requires. Although the process has slightly improved, many asylees were detained for months, also in violation of the law. One of the problems is that Mexico’s Commission for Refugee Assistance has two offices outside of the capital; its skeletal staff was able to process fewer than 5,000 cases last year. Another is the widespread corruption and violence targeting migrants, often from the agencies and officials mandated to protect them. And Mexican society isn’t ready for the influx. Not unlike the United States, some Mexicans worry immigrants will take their jobs, depress wages, or commit crimes. Violence against these newcomers has been on the rise: In 2016 alone, the Mexican government found more than 5,000 cases of crimes against migrants, nearly 20 percent at the hands of government officials. In short, Lopez Obrador may well be caught between his promises to be more open and humane to those fleeing and the desire to no longer do president Trump’s bidding, and the huge potential costs this shift could entail for his larger domestic agenda. With Mexico’s migratory agencies and services so ill-equipped, absorbing an influx would take away resources away from his efforts to lift up Mexico’s poor. On the other hand, if Lopez Obrador allows more Central Americans to flow north, Trump could well respond by clamping down further, creating a greater burden for states in northern Mexico. Mexico has long been a sending country, with millions of its citizens living abroad, mostly in the United States. It is now increasingly a receiving nation, caught between desperation to the south and xenophobia to the north, with few tools to safely manage these inflows. Lopez Obrador’s team already faces the burden of realizing his expansive campaign promises. Resolving a migration crisis on its southern border may not have been high on its list. But part of governing, of course, is preparing for unpleasant surprises.